Chemistry Week, taking place this week at BU, is one of a number of outreach programs that have received federal PromoScience Grants support. BRANDON, Man. – Science outreach at Brandon University (BU) is getting a boost thanks to an influx of federal funding. The BU initiatives will receive more than $90,000 over the next three years through PromoScience Grants administered by the National Sciences and Engineering Research Council for Canada (NSERC). Dr. Nancy Stanley and the Mini U program at BU have received a three-year grant worth a total of $66,000 to assist in the operation of the popular day camp program for youth. Additionally, Physics and Astronomy Professor Dr. Tyler Foster will receive a total of $15,877 over three years for outreach programs including a “telescope library” at BU. Stanley was also successful in attaining two supplementary grants of $5,000 each for Science Odyssey and Science Literacy events. Each year, more than 1,100 youngsters from pre-kindergarten to Grade 8 participate in Mini U. Stanley, the Director of Mini U, said that the grant money will go toward wages for science instructors, software, equipment and supplies for the camps. The grant will also open the door for expanded Mini U programming. “We’re absolutely thrilled with this grant, and to have it for three years allows us to plan,” said Stanley. Foster’s PromoScience Grant will help bring the universe to Brandon. It will be used to continue and expand a highly successful outreach and promotion program that includes open observing evenings at BU’s observatory, hands-on training in digital astronomy for youth and the establishment of a telescope library. Teachers will be able to borrow simple-to-operate telescopes, learn to use them and hold observing evenings for their own students and their families. One of the Supplemental Grants will fund Chemistry Week at BU, which this year will be part of Science Odyssey, a series of events being held across Canada this month to celebrate science. 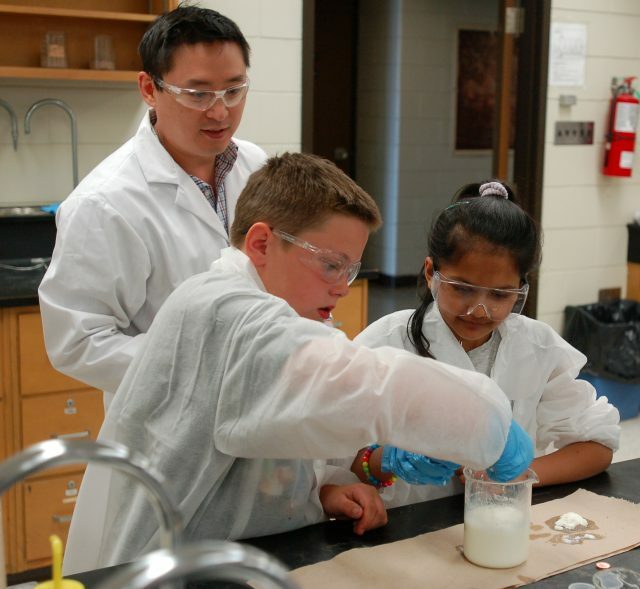 Running from May 15–19, Chemistry Week will bring about 100 students from eight rural high schools and more than 250 students from eight elementary schools to BU for fun and educational experiments. Plans are still being formulated for the Science Literacy event, which will take place in September. Students will work with faculty members to design activities that will showcase STEM (Science, Technology, Engineering and Mathematics) topics in fun ways.